Everyone appreciates being recognized for their hard work, and it can be especially satisfying when that recognition comes in the form of money. Unfortunately, the Internal Revenue Service will have its hand out for some of that cash. It almost always does when money or property changes hands. Your bonus will most likely take a bit of a hit in the form of tax withholding at the time you receive it. The good news is that you might get a portion of that money back at tax time. It’s no different from over-withholding from your paychecks during the course of the year. The IRS will refund the excess. The IRS classifies bonuses as “supplemental wages,” along with severance pay, taxable fringe benefits, and—technically—vacation pay, back pay, and overtime. Supplemental pay is pretty much anything other than your regular pay, and it’s subject to its own withholding rules. These rules depend to some extent on how your employer pays you the money. First, let’s assume that your employer just loves you to death. The company gives you a $1.5 million bonus. Don’t spend it all just yet. The first $1 million is subject to a 22% withholding rate as of 2019. Just like that, your bonus shrinks to $780,000 because $220,000 goes to the IRS right off the top. Now brace yourself. 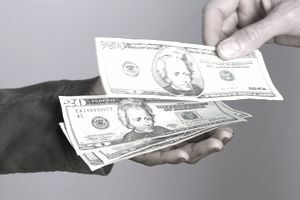 The $500,000 you received over $1 million is subject to withholding at the rate of the highest tax bracket that year, 37% as of 2019. That’s another $185,000 that goes directly to the IRS. Your total withholding on that $1.5 million works out to $405,000: the 22% rate ($220,000) plus the 37% rate ($185,000). Of course, that’s still $1,095,000 that you didn’t have before. The rules are similar for the rest of the working world, except you get to dodge that 37% withholding or whatever the highest tax rate is in the year you receive your bonus. And your employer has two options when it comes to calculating how much to withhold. Your employer can simply withhold that flat 22% that’s applicable to all supplemental wages under $1 million. The IRS refers to this option as the “percentage method.” This would result in a withholding of $660 if you receive a $3,000 bonus. This rate applies even if your regular wages fall into a tax bracket that’s greater than 22%…or less. As the name suggests, this option is more complicated. Let’s say your regular pay is $1,000. Your employer also gives you that $3,000 bonus, all in one paycheck. Withholding is first calculated on your regular pay plus your bonus according to the aggregate method, based on the information you provided on your Form W-4 and the IRS withholding tables. Nothing new here—your employer has been doing this with your regular pay all along. Now the same rate of withholding is calculated on just your regular income. This figure is subtracted from the withholding on the total combined amount and the result is then withheld from your bonus. As explained in IRS Publication 15, it works out like this: You might be subject to $300 withholding on the total combined wage and bonus income of $4,000. Withholding on your regular pay of $1,000 might work out to $50. Your employer would subtract that $50 from that $300 figure and would withhold $250 from your $3,000 bonus. These methods don't apply when you receive your bonus lumped together with your regular pay, all in one check, and your employer doesn’t specifically make note that the bonus amount is separate and apart from your regular pay. In this case, the total—your bonus plus regular wages—is subject to withholding just as though it was all your regular pay. Otherwise, your employer must use either the percentage method or the aggregate method to calculate withholding. These calculations apply only to federal income tax. The usual withholding rates for Medicare and Social Security also apply to bonuses, as well as any state income tax you might be subject to. Needless to say, your employer would probably prefer to use the percentage method; it’s a lot easier. As for which benefits you, it can come down to your tax bracket. If you’re in the 24- or 32% bracket, the withholding on your bonus is going to be more using the aggregate method. If you’re in the 22% bracket, it’s something of a wash.
And if you’re in the 12% bracket? Ask your employer to use the aggregate method. Bonuses might be subject to their own withholding rules, but they’re treated just like your other ordinary income at tax time. And tax brackets and their applicable rates are based on your taxable income—what’s left after you claim various deductions and credits you’re entitled to. So now let’s say that you prepare your tax return and it turns out that what was withheld from your bonus was way too much based on your end-of-year tax rate on your taxable income. Not to worry. The IRS will issue you a refund for the money withheld from your bonus if it turns out that the 22% rate or a higher withholding rate was too much based on your overall income at year’s end. Of course, if you end up in a higher tax bracket than the rate at which taxes were withheld from your bonus, you could end up remitting a little extra to the IRS at tax time. Note: Tax laws change periodically, and you should always consult with a tax professional for the most up-to-date advice. The information contained in this article is not intended as tax advice and it is not a substitute for tax advice.